drafting on feature. - Drawing interpretation. I have this question that is confusing me. 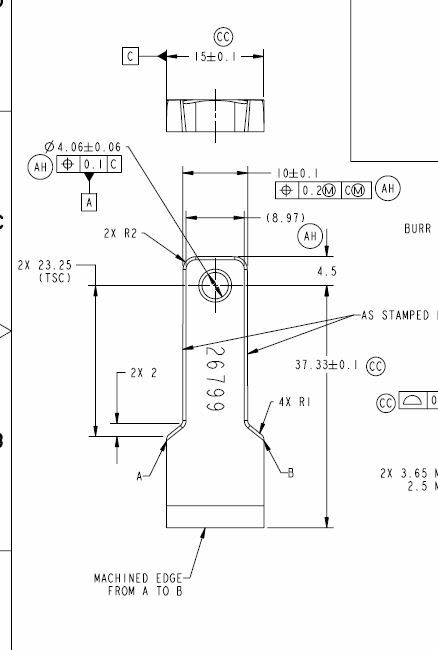 According with the designer, this part has a draft, he make reference to a "Drafting standards - ASME Y14.5"
Where he indicates that the feature doesn't control size and form, this mean, part can be out of spec, dimension and tolerances not apply on draft part. For more explanation see ppt attached. According with the drawing there is not a draft tolerance and because "Drafting standards" allow to be out of spec. On cad there is not draft specified either. In your experience, how this should be interpreted. RE: drafting on feature. - Drawing interpretation. The implied angles have no effect on measuring the width. There are other things wrong with the drawing. Also - the drawing was made with PTC Pro/E or Creo. Not that it makes a difference, but I know these things. what else you did you see wrong? 1.) If a draft is allowed then why it is not specified with” +DFT”, ”–DFT” or “DFT INCL” as per ASME Y14.8? 2. )Why you have to fit the part in a perfect square gage? Why not only within an envelope or perfect two parallel plane 15.1 apart?